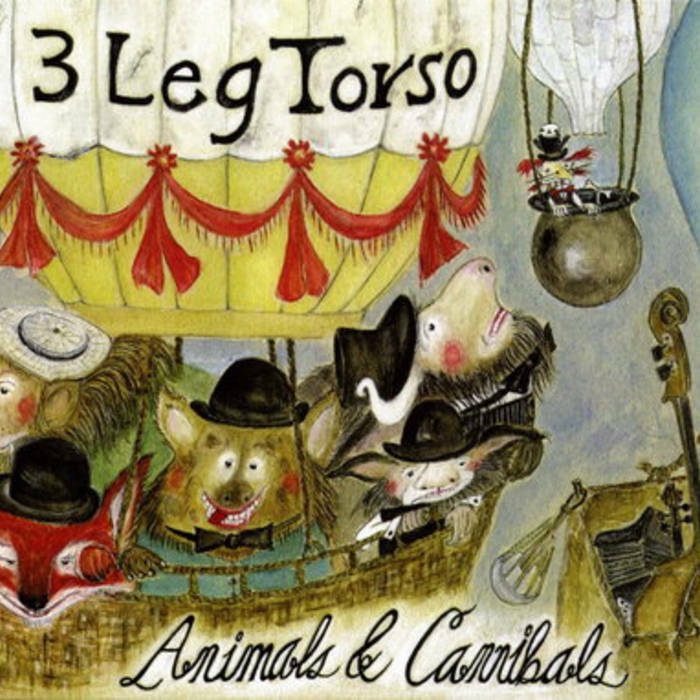 Cartoon soundtracks and movie music come to life on Animals and Cannibals, the fourth 3 Leg Torso album (their first in seven years). Considering that this elite ensemble hides under cover in Portland, Oregon, the caliber of musicianship in the band is staggering. Violinist / leader Béla Balogh plays seemingly anything that occurs to him with power and accuracy while accordionist Courtney von Drehle gives the band a European continental sound. Together both men are wonderful composers and arrangers as well. Two mallet players contribute to the Looney Tunes sound, also contributing excellent drum kit playing. Some of the songwriting compares positively to the style of the Dixie Dregs and guitarist Steve Morse, if you can imagine it being played on violin, accordion, and marimba. Rip-roaring gypsy tangos feature violinist Balogh and marimba player Gary Irvine, and on “Bus Stop to Oblivion,” wild polkas degenerate into country two-steps, sodden with beer. The Hot Club of France was never as wonderfully psychotic as this! Lars Hollmer, Miriodor and Hamster theater fans should give this one a try.